I fear this post is going to come as a huge disappointment to a great deal of you. Many years ago, I started the You Decides as a way of getting my readership involved in the blog decision-making process (such as it is), with the idea of plugging any glaring gaps in my post history or uncovering some under-reviewed gems. Very soon - because people are awful and people on the internet doubly so - it descended into a game of "what's the worst place we can send Chris to eat at", and so once a year I dutifully trotted off to rotten ripoff joints like the Rainforest Café and Frankie & Benny's, ate an overpriced meal of frozen chips and grilled chicken then wrote about how much I hated it. Every year, another diabolical theme restaurant or godforsaken chain won the poll, another terrible meal where the only comfort was to get as drunk as possible on sugary lager (the utter crappiness of crappy restaurants easily extends to the drinks list) and wishing the whole thing was over as quickly as possible. And each time I thought this year's choice couldn't possibly be worse than the last, and yet somehow each time it was, reaching the absolute nadir in 2016 in the form of JRC Global Buffet, a place so utterly devoid of charm and hospitality that I still feel I left a part of my soul there, scattered on the filthy floors like so many discarded spring rolls. I nearly didn't do a public vote this year. Not so much to save myself the misery of another awful evening (I can take it), but just because I was running out of things to say about these places. Bad restaurants, you see, are all bad for pretty much the same reasons. They're selling horrible frozen food at huge markups, service is indifferent, the drinks list is moribund and the whole experience is about as much fun as having a root canal. It may be occasionally fun to read somewhere being torn apart on a restaurant blog, but if I just end up having the same moan year after year it becomes a bit boring and a bit, well, pointless. How nice, then, that the Toby Carvery in South Croydon won this year, and turned out to not be completely awful. Don't get me wrong - it's not a great restaurant. It's not even a particularly good restaurant. But I did leave after dinner not wanting to saw my own arms off with a blunt hacksaw and so is at least better than anywhere else so far that's won the public vote. The least enjoyable part of the whole operation is the food, so I'll do that first. 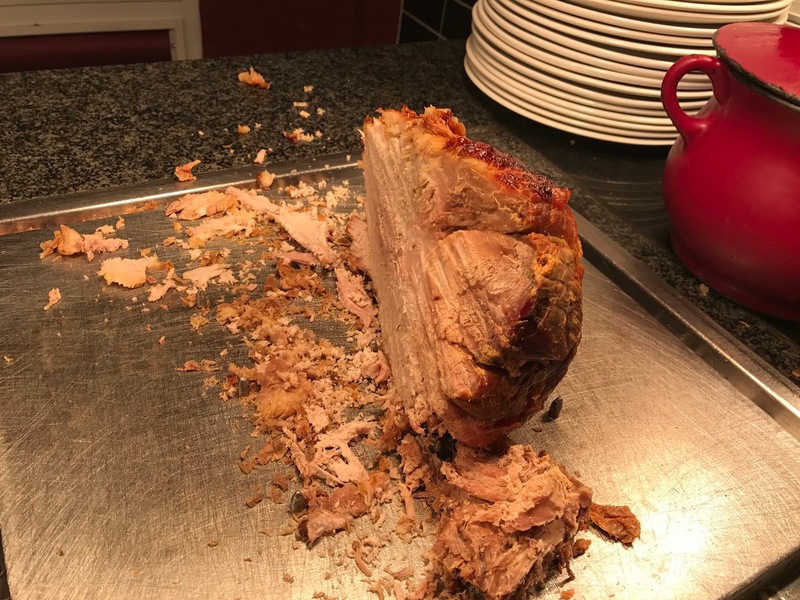 This may be an obvious thing to say, but you are never going to get a very good bit of roast beef, roast turkey - roast anything, for the princely sum of £6.99 a head. 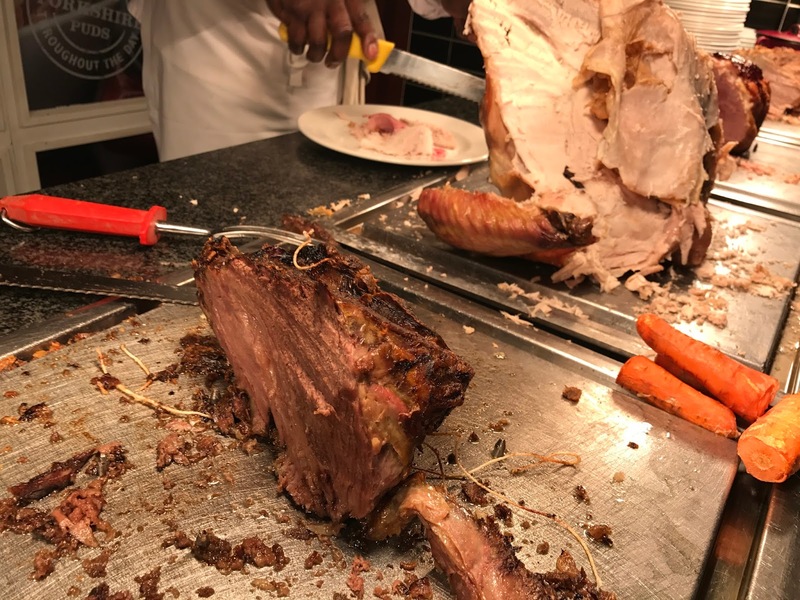 The huge lumps of meat sweating under the lamps at the Toby Carvery won't be artisan cuts from small producers, they won't be organic or ethically farmed or even probably fully traceable. They'll be the very cheapest bits of pig, cow and turkey that money can buy, overcooked to keep the greatest number of pensioners from sending any of it back. Which is all perfectly fine, of course. I personally would not choose to eat pork so dry it resisted the game attempts from the member of staff to carve it into need slices and instead collapsed into pork dust. I would not, in the course of a usual day, travel to South Croydon to crunch through "roast" potatoes cremated to the colour of volcanic rock, or rehydrated gravy tasting of wallpaper paste. 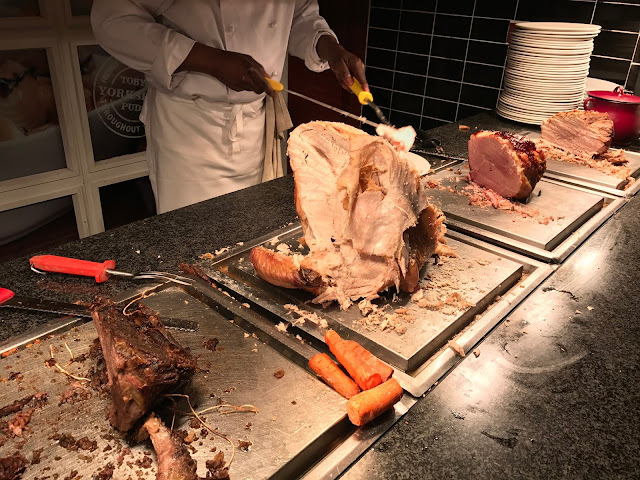 I am not, in my London Elite bubble, Toby Carvery's target market. But I know more than a few members of my close family who would very much enjoy a cheap roast in a restaurant attached to a Travelodge of a Sunday afternoon, and indeed do so on a regular basis. 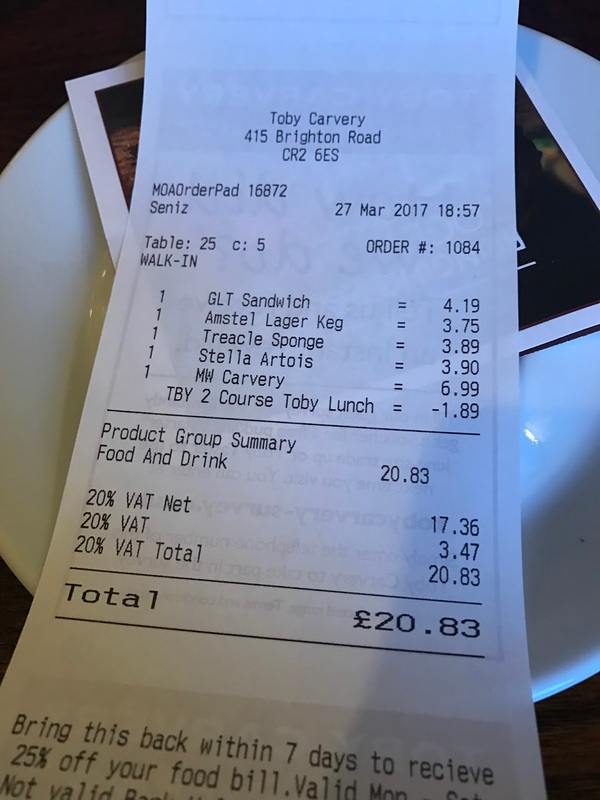 You may wonder why I'm being so pragmatic about the Toby Carvery when I've given other chains like Frankie & Benny's or Bubba Gump such a hard time. It's a fair question. 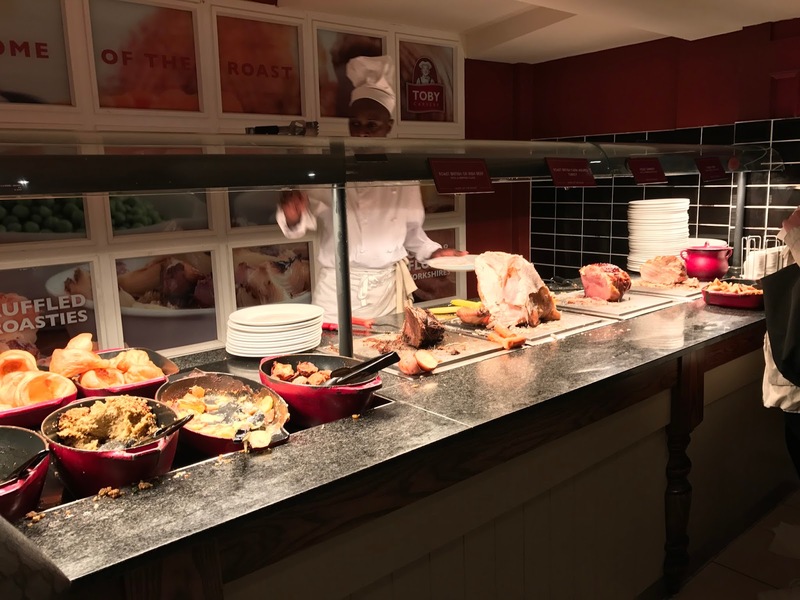 The quality of the food at Toby Carvery is hardly any better - if at all - than any other rotten chain you'd care to mention, and I could easily make a point about the damage the demand for this lowest-common-denominator commodity meat does to our food chain and animal welfare standards. But in a strange way it just feels better - there's a certain honesty to it all. It's not pretending to be a New York Diner from the 1950s or a Louisiana Shrimp Boil, it's just a place to have a cheap roast. 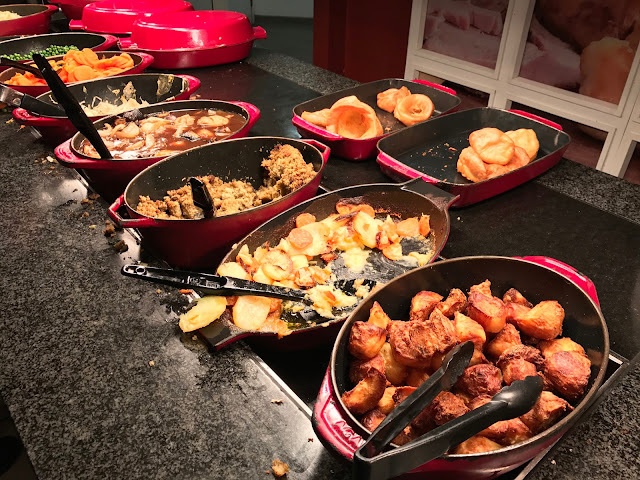 And crucially, unlike so many other chains, it is cheap - my plate of vaguely edible meat soaked in packet gravy and topped with oily Yorkshire pudding cost £6.99, a pint of Stella £3.90. 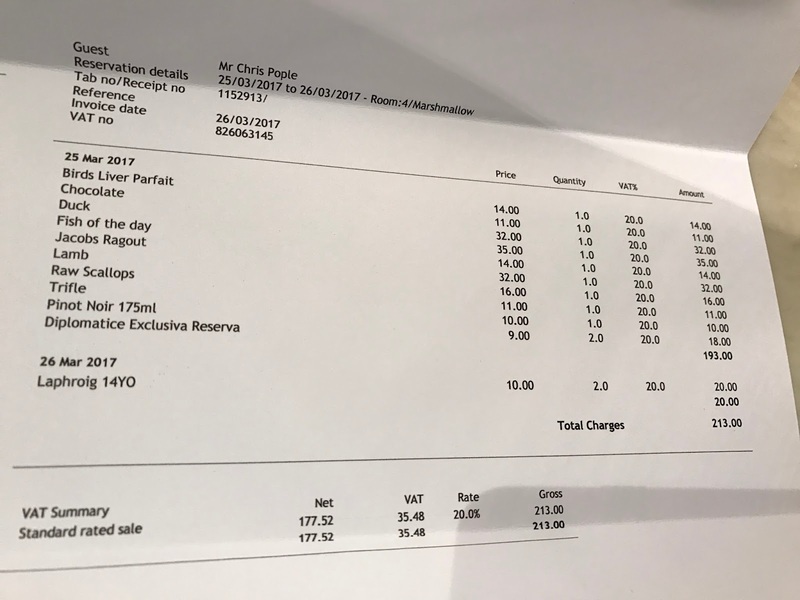 You get what you pay for - in a good way. Even so, all of this would still not really be enough to lift the score out of ten out of the basement were it not for the service at the Toby Carvery South Croydon, which was - and I'm not being in the least bit patronising here - up there with the very best I've ever had the pleasure to experience anywhere in London. 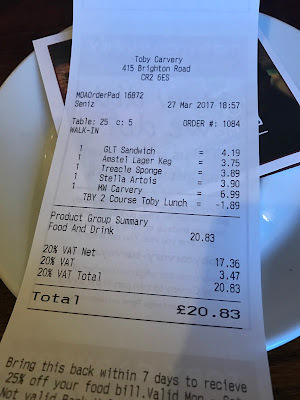 The receipt has the name "Seniz" on it, and so if that was the girl who took our order smartly and articulately, brought drinks and non-buffet food items, all without us barely having to look up to catch her attention, well, then Seniz, you deserve every bit of the tip we left that Toby Carvery didn't even ask for. 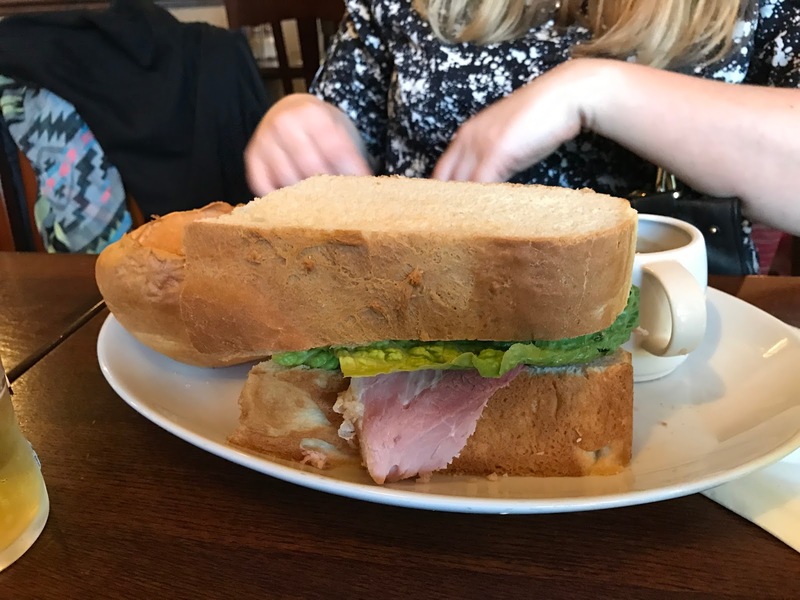 Also full marks for keeping a straight face while bringing my friend the most ridiculous looking 'sandwich' either of us had ever seen in our lives - seemingly an entire white loaf cut lengthways with some salad and ham inside. Brilliant. If ever there was a mediocre meal lifted by sparkling service, then, it was our little trip to South Croydon on a Monday evening. And I'm sorry - again - if my not having a completely godawful time is a disappointment to you, but that's just how it went. I didn't hate Toby Carvery, and the fact I even stayed for dessert (treacle pudding and custard, like being back at school) shows you how much I didn't hate it. In fact we were not hating it so much we would have considered another pint in the bar were it not for a group of young men talking loudly about muslims over-running the country (though seemingly not South Croydon based on the demographic out that night) which spoiled the atmosphere a bit. So we got the train home, in all honesty most likely never to return. I'll miss Seniz, though. Luxury has a certain aroma. It's the perfume of expensive Diptyque candles and elaborate flower arrangements in hallways with polished marble floors, of Aesop handwash in plush bathrooms, of the very best fragrance atomisers and scented oils and incense burners money can buy. 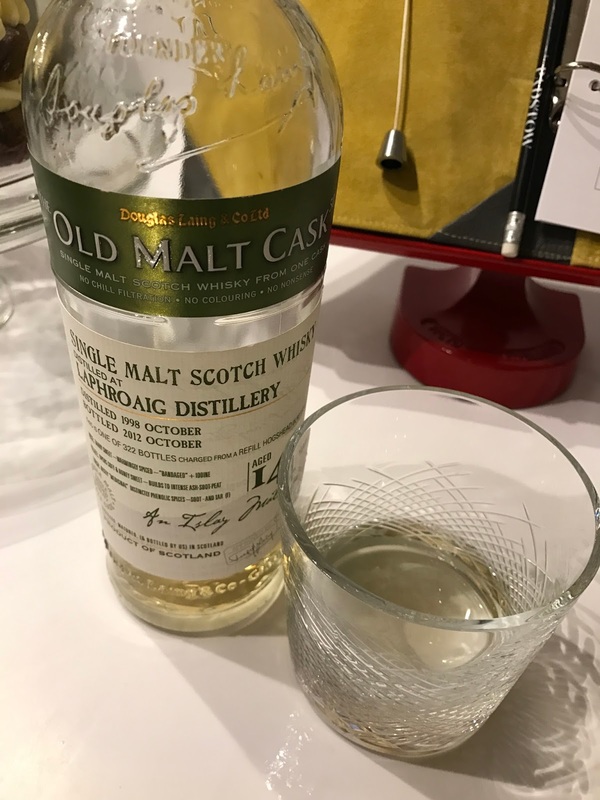 It's a mix of aromas that follow you from the foyer at Claridge's to the grand staircases of the Rosewood and the wood-panelled corridors of the Connaught, anywhere people with immaculate taste and infinite budgets work to create an atmosphere of easy decadence. It fits, then, that the first thing you notice as you step through the door of the Padstow Townhouse - a grand and luxuriously well-appointed pile on a commanding position overlooking this pretty fishing village - is a glorious waft of cinnamon and vanilla from a tastefully discreet source somewhere in the common areas. Because make no mistake, despite missing one or two of the trappings of five-star hotel - there's no basement swimming pool, vaulted reception or residents' bar - the rooms (or, more accurately, suites) are every inch to international luxury standard, and staying here is an experience on a par with the very finest accommodation options in the country. Perhaps I should try harder not to be so superlative. It is, after all, essentially "just" a glorified B&B - there are bedrooms (fantastically spacious and beautful bedrooms, lit by the whitewashed North Cornwall sun, yes, but still just bedrooms), bathrooms (clawfoot copper baths and rainforest showers, with heated floors, true, but still bathrooms) and breakfast in bed (admittedly soft-boiled duck egg, smoked salmon and caviar muffins, yuzu shots, fresh pastries, summer fruit compote with organic yoghurt, local cheeses and charcuterie may not constitute your usual breakfast but it is still, technically, breakfast). Service is attentive to the point of supernatural - somehow you only had to look like you needed something and a member of staff would magically appear from around a corner, and not once in two days did I manage to get to the front door before someone opened it for me. All these things are, on one level, what you might expect from a B&B, only they're all the absolute best you can possibly imagine they can be. Anyway, rather than banging on any more about how wonderful the Padstow Townhouse is, I'll just leave the above photos from my stay with you to fill in the details, and turn back to much more comfortable ground - what I had for my dinner. Five minutes walk down the hill into town is No. 6 by Paul Ainsworth, gleaming from a recent refurb and ready once again to be the standard-bearer of gastronomic achievement in Padstow. I've been a fan of the place since a sadly rushed lunch there a few years ago as part of a press trip (there is no part of a press trip that isn't rushed) and determined to come back and do the whole thing properly. And boy, am I glad I did. I can hardly imagine a better showcase of the talents of Cornwall's fishermen, farmers and bakers than Paul Ainsworth and his team, who tie the rich bounties of the area together with an artist's eye, supreme command of cooking techniques and a menu of wit, sparkle and invention. The joy begins with the bread course, presented with local Cornish sea-salted butter, fluffy cod's roe sprinkled with pork scratchings, and a kind of yeasted/caramelised butter bringing to mind a similarly stunning version by one of my favourite London restaurants Pidgin. Oh, and the bread was superb too, a bright, sticky crumb encased in a dark, toasty crust. There are few finer things in life than a really good liver parfait made by people who really know what they're doing, and Paul Ainsworth's version is absolutely the last word in the matter - perfect parfait, if you will. Scallops were dressed in a really interesting citrussy dressing described as "gentleman's relish" on the menu so perhaps it involved anchovy as well somehow. The "kimchi-style" cabbage was only very lightly pickled and not too burdened with chilli, but provided good texture and an interesting (and slightly unusual) vegetal contrast to the seafood. "Jacob's ragout" was a very clever idea - ribbons of turnip that looked for all the world like egg pasta, with a cute little copper pan of beef ragu, satisfyingly full of flavour and with a slight heady note of vinegar to stop it becoming overwhelmingly rich. If I'm going to be brutally honest, I probably would have preferred actual pasta than turnip pasta - the promise of a few silky threads of the real thing could never be satisfied by a vegetable - but I appreciate what they're trying to do and I still enjoyed it. Tamar Valley lamb, boned shank I think, was a glorious soft texture, with not a hint of the chewiness that can afflict certain slow-cook cuts. It was seasoned with a wafer-thin slice of mutton ham, and salt-baked celeriac (and celeriac purée) underneath provided an earthy hit of winter veg. 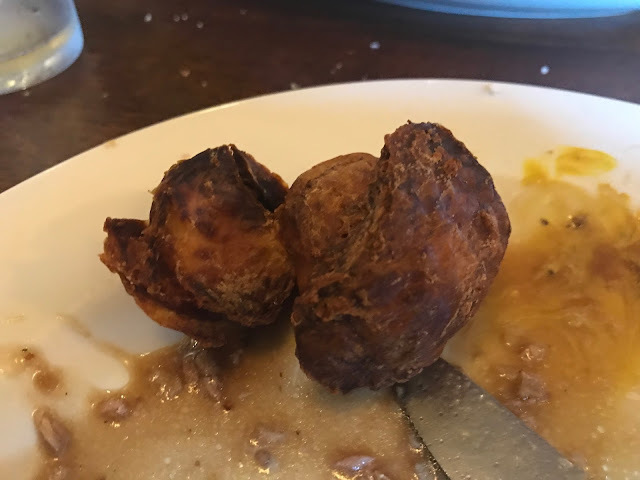 On the side, a breaded and deep-fried nugget of sweetbread came with a fantastic rich reduced jus that only the very best restaurants have the skill and energy to make. If lamb and celeriac is the perfect winter dish (and I'm increasingly convinced it is) then it surely can not come in any more satisfying form than this - a riot of texture, colour and flavour. I'm afraid I didn't get a very good shot of the roast duck itself, so you'll have to take my word that the timing on the flesh was spot-on, the flavour of the duck powerful and gamey, and the accompanying "clear peking tea" in a cute mini teapot, containing duck consommé and a lemon and herb "teabag", was a masterful take on Chinese flavours while retaining a solid European (or rather Cornish) identity. The pot, by the way, contained "pick your own" salad, bits of dressed veg and crispy bacon to dip into as you enjoyed the duck. Best of the mains, though, was - naturally - fish. A fillet of bream, prepared so utterly perfectly it had somehow transformed into something close to the texture and flavour density of halibut - blinding white flesh, with a good strong skin of golden-brown, fatty wonderousness. This miracle of a fillet would have been enough simply by itself but with it came a pot of deep-fried seaweed (seasoned with salt and vinegar), oyster leaves, foraged ransom (sort of like wild garlic) flowers and white crab meat, which combined to form a symphony of colour, texture and spectacle that made the entire trip to Cornwall worthwhile by itself. 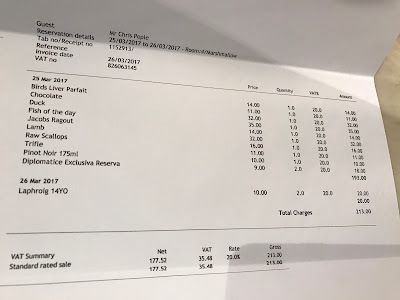 Instead of a full fancypants cheese trolley, Paul Ainsworth go down the route of highlighting a single cheese - in this case Barkham Blue - as a kind of pre-dessert. Barkham Blue is a genuinely excellent cheese, strong and salty without being bitter, and with a lovely creamy texture. Presented with a miniature tart tatin, it becomes a clever take on the Eccles cake & Lancashire cheese combo, only possibly (and don't tell anyone from Lancashire this) more rewarding. Oh and that's a little mug of cider on the side there, because why not. Desserts proper were enjoyable, if a little less overwhelmingly brilliant than what had come before. Cornish "trifle" with rhubarb and blood orange was as good as cream, rhubarb, ice cream and blood orange spongecake can probably be, namely "quite" good. And it's always fun when a bit of theatre such as the pouring in of molten "caramac" livens up a chocolate mousse, and even more fun when it turns out the chocolate (named as Michel Cluizel 100%) has as powerful and complex a flavour as this. It wasn't otherwise a particularly mind-bending dish but then taking one high-quality ingredient and presenting it simply is sometimes all that's required. I didn't hear anyone on our table complaining, at any rate. 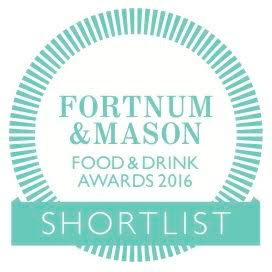 Maybe usually petits fours and digestifs are taken in the No. 6 bar upstairs, but as we were staying at the townhouse the fun continued back up the road, with a glass of 14-year Old Malt Cask Laphroig from the pantry, a couple of fruit macarons and a flask of Paul Ainsworth malted hot chocolate (which involved orange and hazelnut liqueur and was an incredible piece of work), these two sites working together to produce a seamless blend of sparkling service and gastronomic delight. I know, I'm gushing again, and yes, the eagle-eyed will have noticed that the Townhouse portion of the trip was comped - feel free to take anything said about there with a crystal of Cornish Sea Salt. But please believe me when I say that Paul Ainsworth at No. 6 is one of the very best restaurants in the country, and a trip to Padstow without a reservation there is a bit like going to Alton Towers and not having a ride on the Nemesis. Or something. Look, I guarantee you'll love it. No matter where you're staying. 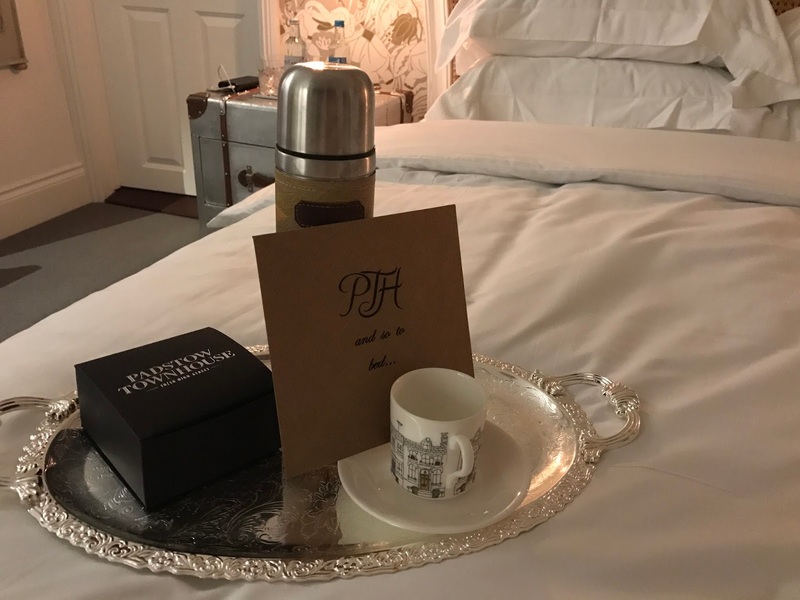 Our stay at the Padstow Townhouse was comped, but we paid for dinner at Paul Ainsworth. A trip to the Berkshire countryside on the weekend demonstrated both the myriad of reasons in favour of leaving the London (comfort) Zones for lunch, and a good number of those against. As we happened to be in Maidenhead with plenty of time before our booking, we thought it might be a good idea (spoiler: it wasn't) to try and squeeze in a quick pint at charming 14th centry pub the Bell Inn, in Waltham St Lawrence. What we weren't to know was that for whatever reason this particular pub was chosen as the end stop of a mass outing from about 1,000 cyclists, all simultaneously in need of food and drink and seemingly quite happy to queue for half an hour for both, which turned our "quiet pint" into a stressful struggle for space and a desperate 5-minute beer gulp. 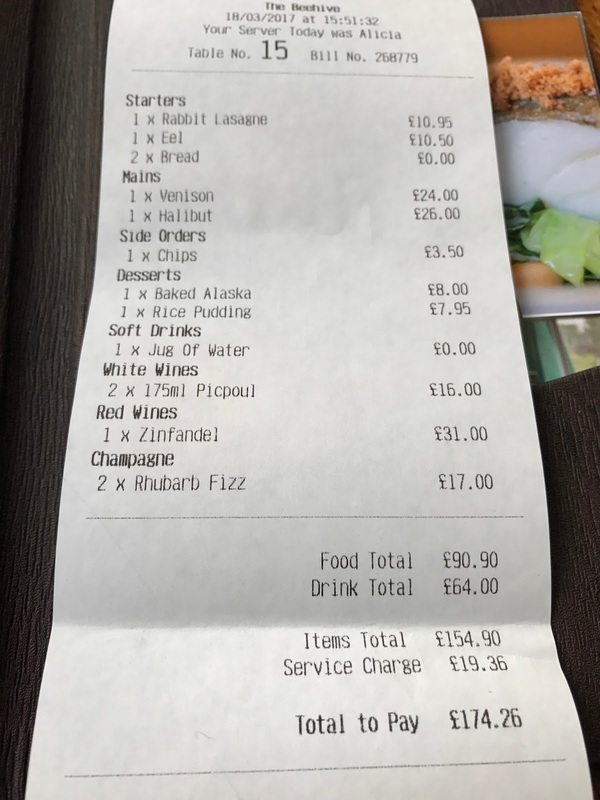 None of that is anyone's fault, of course, but it did mean that after being asked for £15 for the 2-minute taxi ride between the Bell Inn to the Beehive in White Waltham, we weren't in the mood for charity. Apparently it was because he'd "had to go to Maidenhead and come back again" - a set of circumstances that you wouldn't think would be too far beyond the remit of a taxi in Maidenhead, but we were getting increasingly close to lunch and increasingly keen to start the day afresh, and so reluctantly paid up. That we ended up enjoying lunch as much as we did, then, is thanks entirely to the welcome and service at the Beehive from surely one of the friendliest and most capable front of houses in the home counties, and of course also to the food served there, an embrace of modern British gastropub cooking that's worth any amount of travel hassle. It began, as such things often do, with house bread, mini crusty loaves with an interesting salty, yeasty glaze (Marmite?) that meant it was almost impossible to not finish off in the space of a few seconds. The Beehive Scotch Egg is a fine example indeed - runny-yolk quail's egg surrounded by boldly seasoned pork and crisply-fried breadcrumbs. Delicate and balanced, with no one part overwhelming another, it would do very well in the annual Young's Scotch Egg Challenge, I'm sure, if they decided to enter next year. And I very much hope they do. Smoked eel salad with bacon and quail's eggs was spotted (not by me of course, by my friend) as being very similar to something Rowley Leigh used to do at Kensington Place, and features in ‘Week in Week Out’ by Simon Hopkinson, which makes sense as chef Dominic Chapman is an alumnus of that college. It was lovely, too - salt and crunch from the bacon and croutons, the soft pieces of eel packing a huge smoky flavour, and then underneath it all a beurre blanc, sharp and richly satisfying. If only all salads were this good. The rabbit filling of this "lasagne" unfortunately suffered slightly from underseasoning, which is a shame because the pasta was a good firm-yet-silky texture and the little wild wood blewit mushrooms packed a strong flavour. There wasn't much sign of the advertised chervil - some miniscule pieces scattered on top seemed to be the grand total of their contribution - but even so, it was a decent, comforting starter. Halibut is a fish that even in less capable hands can still impress with its dense, meaty flesh and rich flavour, but when it's prepared by an expert, like at the Beehive, it really sings. This really was a beautiful bit of seafood, with its bright-white flesh and delicate crisp skin, and the accompanying samphire, mussels and brown shrimp all added to the fine, tried-and-tested formula. The jury's perhaps out on what role cherry tomatoes really needed to play, but this was a minor niggle. Venison came with one of those reduced sauces that I always lose my mind over. It's mainly because they taste incredible, but I think it's also because I know they're a labour of love to make, taking many hours of reducing and skimming and waiting, and requiring - for the best examples - lots of good veal bones, port and Madeira. The fact that underneath this Sauce Of Wonder the venison itself was only OK (a tad dry, and underpowered flavour-wise) was a mere distraction - this dish was all about soaking up the house mash (buttery and smooth, and seasoned perfectly) in the sauce and savouring every sticky, savoury mouthful. It felt like the dessert offering at the Beehive had a little less attention paid to it than the savoury courses, but there was still plenty to enjoy in this rice pudding with jam doughnuts. You'd have to be a pretty difficult individual not to enjoy warm rice pudding and fresh jam doughnuts. So, desserts not worth getting ripped off by a taxi driver and battling through 1,000 cyclists for, then. But most of the rest of it really was, and we thoroughly enjoyed our lunch in this bright and friendly little spot in rural Berkshire. It's worth mentioning again the front of house, who matched our courses with some nice wines (one of which, a Chablis, was left over from a party the night before and offered free of charge), brought everything in good time and in good humour, and basically gave a masterclass in service. And as much as I like to think I'm not swayed by such things, it really is the whole package you come to places like the Beehive for - great food, yes, but also an atmosphere of warm, open generosity. And I have one more reason to appreciate our server at the Beehive. After hearing our story about corrupt taxi drivers, she offered the magic words "oh, we have Uber here now!" and with that, all our problems were solved. After spending £30 to get there, the ride back to Maidenhead cost £6.90. There's never been a better time to head out west of a weekend.